And the E Foam Band. Sometimes you take the prescribed dosage of the anti-anxiety medicine your doctor gave you. You take it at night like you’re supposed to. And sometimes it makes you really high. And you just watched a romantic comedy. Which, for some strange reason, didn’t make you happy like they normally do. And you get all angry at people in love. 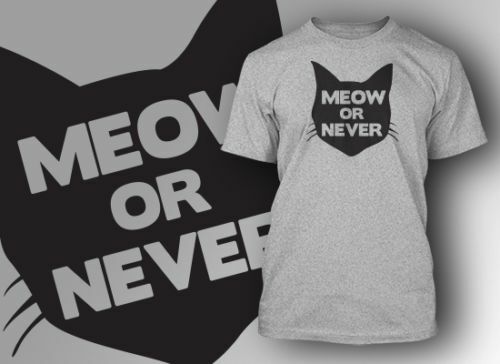 And you wind up buying yet another cat t-shirt. But you downloaded the soundtrack anyway because it was most excellent. Told you the soundtrack was awesome. And you thought it was just the drugs talking. Oh, ye of little faith. I knew a little Faith once. So was so small. So firm. Yesterday, what was supposed to be a brainstorming and planning session turned into a printing session. I made another postcard. This one says “It Is Okay To Be Weird”. I’m going to attempt to print a couple more this week. I’m still getting used to this press, so there is a lot of improvising. Real printers would groan and face palm themselves if they could see the process by which I am printing. But necessity is the mother of invention. Needless to say, I’ve been inventive. And with that, I’m outta here. Postcards won’t print themselves and there are so many push-ups to do before I can go print. « An Exercise In Productivity.